NEW YORK – The Harlem School of the Arts (HSA) will launch the Fall 2016 Season with its first original student theatre production, All The News, a dynamic fast-paced satire of contemporary news programs and infotainment. It is written by HSA Theatre Alliance students, directed by HSA Artistic Director Alfred Preisser and Obie Award-winner and HSA Alumnus and Artist in Residence Chris Myers; and will include a guest appearance by HSA’s newest performance group, Legacy Arts Ensemble. The show will run from Friday, September 23, through Sunday, September 25, 2016, at HSA’s Theater located at 645 Saint Nicholas Avenue, New York, New York 10030. The HSA original production will employ sketches, jokes and spoken word to explore American culture and the 2016 Presidential Election via the nightly news, social media and music. All The News will also feature Legacy Arts Ensemble, HSA’s new performance group/class that employs West African dance, drumming, singing and storytelling principles to create original works with strong social justice themes. Students will also be working with Obie Award-winner, HSA and Julliard Alumnus and HSA Artist in Residence Chris Myers, who will be joining Preisser as a co-director of the show. Tickets are $20 in advance and $25 at the door; and $15 for students and seniors; $18 for groups; and can be purchased at www.hsanyc.org. Harlem School of the Arts Artistic Director Alfred Preisser is a New York based writer, director and producer of theatre. He has directed and produced over fifty professional shows in New York, regionally and Europe. His work has been recognized with the American Theatre Wing Award (Outstanding Artistic Achievement), Drama Desk Award (Artistic Achievement), Edwin Booth Award (Outstanding Contribution to NYC Theater), Lucille Lortel Award (Outstanding Body of Work), two Obie Awards (Sustained Achievement and Excellence in Theatre) and numerous Audelco Awards. His productions of Aint Supposed to Die a Natural Death and Caligula are archived at Lincoln Center for the Performing Arts, and he has taught directing, acting and theatre studies at CCNY in Harlem, The Frederick Douglass Creative Arts Center, and Stella Adler NYU. Additional career highlights include Founding Artistic Director, The Classical Theatre of Harlem (1999 – 2009) and Director of The Theatre Program, The Harlem School of the Arts (1999-2007), Macbeth at The Bonne Biennale, Sweet Sweetback’s Baadasssss Song: The Musical at Sons Hiver in Paris (2010) and Central Park Summerstage (2012 and 2013). Harlem School of the Arts Artist in Residence Chris Myers is a New York City born and based artist, and the recipient of a 2014 Obie Award for his performance in Soho Rep’s An Octoroon. He has worked on new plays and classics, feature film, TV, commercials and voice over with industry icons such as Woody Harrelson, Phylicia Rashad, and Frank Langella. Chris received a B.F.A. from The Juilliard School and trained at the British American Drama Academy. He began acting at age 12 at the Harlem School for the Arts and then the renowned “Fame” school, LaGuardia High School for Performing Arts. In 2010, he co-founded the Special Sauce Company, which works to make ensemble based site-specific theater free of charge. As a teacher he has taught workshops at LaGuardia High School, Epic Theater Ensemble, Northside Center, the Outreach Brooklyn program for recently incarcerated youth, and Horizons Juvenile Detention Center with Drama Club NYC. He also conducts acting coaching and mentors NYC youth with PLOT. Having written and self-produced his first short, Post-Emma, he is currently expanding into writing for film, theater, and web. For over 50 years, HSA has enriched the lives of tens of thousands of young people ages 2-18 through world-class training in the arts. HSA offers its students the freedom to find and develop the artist, student, and citizen within themselves in an environment that teaches discipline, stimulates creativity, builds self-confidence and adds a dimension of beauty to their lives, empowering them to become the creative thinkers and innovative leaders of tomorrow. 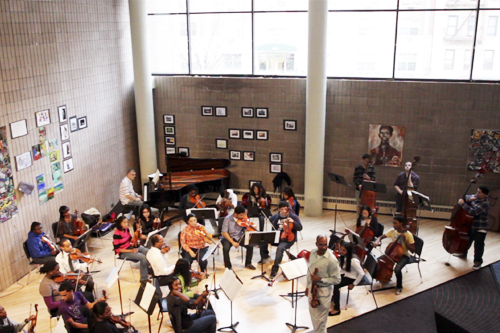 To learn more about the Harlem School of the Arts please visit hsanyc.org.